About Our Company & Our History - Bunker Hill Supply Co.
Bunker Hill Supply Company is a family-owned business that takes pride in serving our community. We offer products we believe in and services you can trust. Whether it is custom spraying, spreading, or Anhydrous Ammonia application we strive to do our best to help our friends and neighbors grow the very best crop possible at reasonable prices. For almost 50 years Bunker Hill has lived and served side-by-side with our customers. We have existed as a business this long because of the relationships we have forged with each other. We would like to thank all of the customers who have been with us for years as well as our new customers who are just learning about the quality products and services we offer. Many often wonder where the name "Bunker Hill" came from. The answer is from the old one-room school house that previously sat on the property just outside of Hutsonville, IL. 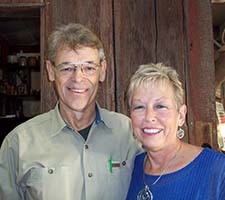 Bunker Hill Supply Co. was first acquired in 1964 by brothers Arlie and Allison Guyer. It was purchased from Joe Morehead and was managed by Arlie and Allison's younger brother Dale. Joe Moorehead was largely involved in the "small seed business" and was a pioneer in "bulk" fertilizer. In 1965, the Guyer's purchased one of the very first high floatation vehicles (The Swamp Buggy) in the Midwest. The brothers decided in 1976 to split their partnership. Allison took over the family farming operation, while Arlie stayed with Bunker Hill. At that time, Arlie's wife, Sarah, became involved with the business and their son, Robin, became a full partner as well. During the 1970's and early 1980's, the company was also heavily involved with farm construction of grain bins, buildings and elevator legs. In 1976, the current office building was built and the company began a major focus on "suspension" fertilizer. The Guyers expanded in 1983 when they purchased the Amoco Fertilizer Plant at Darwin. Later, in 1987, they purchased the Gene Hamilton Company Plant at Annapolis. Sadly, Arlie and Sarah both passed away in 1997. However, Robin and his wife, Belma, continued to grow the company. In 2007, they purchased the Keys Fertilizer Plant in Paris, IL. Today, Bunker Hill still holds to the same values and principles it was founded on and we are proud to serve not only our friends and neighbors in Hutsonville, but also in Annapolis, Darwin, Paris, and parts of Indiana.